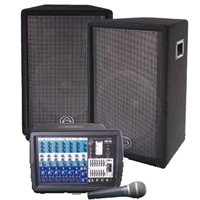 A PMX System includes a Wharfedale Pro PMX powered mixer, a pair of 2-way loudspeakers, a DM 1.0 dynamic microphone and the necessary cables to connect the system. The PMX 700 System includes a powered mixer, microphone and two Wharfedale Pro PT-X12 loudspeakers with 12" woofer and true compression driver. Comes complete with all the necessary cables to connect the microphone and loudspeakers.